In the current state, the ability for higher education institutions to provide holistic assessments of student learning, development, and success and to provide comprehensive advising (using curricular and co-curricular data) and other student services using disparate systems is virtually impossible. This is because the interoperability between systems may be limited or they require IT staff/vendors to develop interfaces so that data can be moved between the systems through some form of files including text, xml files, or other means. In addition to the limited interoperability, the lack of data liquidity (ability to move data from one system to another) which I shared in this post is even a bigger constraint. That there is not a single common structured data model in higher education is one of the big impediments towards an environment where disparate systems within the institution can have a set of systems working together as one. Even a bigger goal is for multiple higher education institutions to have the ability to exchange information between their systems in cases where students may be attending both institutions or if they transfer from one to the other. I wrote this blog about a proposal for a Common Learning Portfolio Markup Language in 2013 based on my observation working with several information systems our university and the inability for these systems to easily exchange data among them. These systems include electronic medical records, student information system, residential management system, judicial conduct, and other systems. What I observed is that these systems cannot interface with each other because they were either created by different vendors or they were developed by our developers. These different systems also did not share a common data model or infrastructure which could make it easier for our developers to readily build programs to exchange data between them without having to develop additional programs to extract, transform, and load (ETL) the data. The US government has also started their effort to standardize education data through a project called Common Education Data Standards (CEDS) project. This project seems to be more abstract in nature in that the data model is not designed specifically for any set of vendor products but rather more of a definition of a structured data model and the adoption is voluntary. It seems we are moving towards the right direction with the efforts I mentioned above, though it seems we are still years away from having a set of common data model that can be used by all higher education institutions. 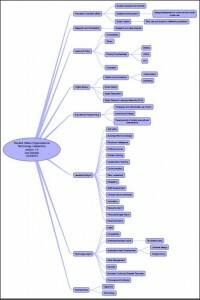 As I noted in my introduction above, it seems to me that until a common structured data higher education data model that can be used as a standard exists, higher education institutions will not be able to develop holistic assessment of student success and to provide services such as advising that use curricular and co-curricular information. Another year of professional growth and learning. 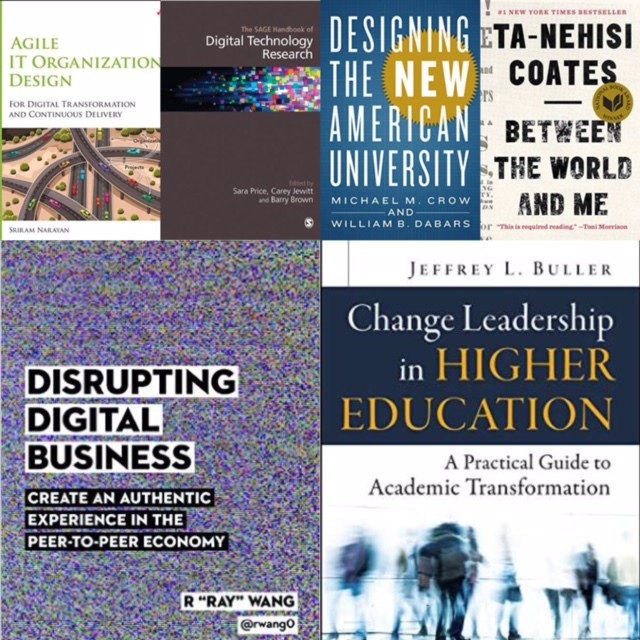 As a significant of my time went to my MBA (IT Mgmt Specialization) course work in 2015, I was not able to devote as many hours to reading about other topics I enjoy such as higher education and student affairs. Nevertheless, I still managed to enjoy reading the books below. As it was with my professional reading lists of 2013 and in 2014, the majority of the books below are kindle books I read through my iphone and ipad. The beauty of mobile learning. Please feel free to ask me for any recommendations. A University for the 21st Century by Duderstadt, James J.
Democracy’s Education: Public Work, Citizenship, and the Future of Colleges and Universities by Boyte, Harry C.
What are the competencies required to be an effective student affairs technology leader at an organizational level? This is a question I pondered while reviewing the Technology Competency Area within the ACPA/NASPA Professional Competency Area for Student Affairs Educators. I specifically mentioned “at an organizational level” because managing/leading the appropriate/effective use of technology at the divisional level is different from one who is leading the efforts at the national or individual levels. There are competencies required to running effective organizations and coordinating technology use at the divisional level. So, I combined the outcomes as defined within the Technology Competency Area and my experience leading a student affairs IT department and produced the mind map of what I view as competencies required to be an effective student affairs technology leader at an organizational level. What other competencies should be included? Thanks! If technology is an essential component of today’s student affairs organizations, how is it that out of the 21 Chief Student Affairs Officers (CSAO) and Senior Student Affairs Officers (SSAO) positions posted on higheredjob.com I reviewed today (11/29/2015), only 1 job posting has the word “technology” in the areas of responsibilities and qualifications? I reviewed the job postings because of my curiosity on how technology is perceived by student affairs organizations today. I think about student affairs and technology daily because of my role as an executive director for a student affairs IT organization. My curiosity is further driven as I think about my recommendations for a recent external program review of a student affairs and academic affairs IT department and as I think about how the recent inclusion of technology as a professional competency as part of the Professional Competency Areas for Student Affairs Educators by ACPA and NASPA could shape the future of technology in student affairs. In addition, I’ve been thinking about how to develop a framework for student affairs organizations to adopt, implement, assess and evaluate technology. 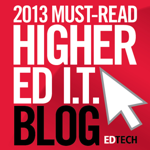 Technology in student affairs can be viewed from many perspectives. For one, technology should be treated as a set of investment that can enable organizations to be more efficient, more effective, and can transform how they do business. As an investment, technology also needs to be managed holistically from an enterprise level, and not as disconnected and silo-ed systems.From this perspective, technology management and leadership requires senior student managers to be thinking about sustainable funding, governance structures and processes, and staffing. Technology as a set of resource to be managed is an idea I discussed in the article “CSAO as Information Technology Manager“. The description above as well as the outcomes stated for the technology competency area acknowledges the essential role technology plays in student affairs. Given the significance of technology in student affairs based on what I shared above, it is then puzzling to me as to why all of the job postings for senior student affairs officers positions I reviewed today, except for one, had no mention of technology as part of the responsibility and/or requirements. What roles and responsibilities should CSAOs/SSAOs have with respect to technology? I did a search on higheredjobs.com using “Vice President Student Affairs” and the results returned 606 records but I reviewed the job postings that contained what could be considered SSAO and CSAO positions (Vice President, Associate Vice President). Some of the postings provided a link to the institutions’ job boards but I limited my review on the description/requirements as posted on the higheredjobs.com website itself. I once read a line related to application development that goes something like this “we (application/web developers) design and build for end-users and we are not the end-users.” One of the biggest mistakes IT folks commit, and I’ve certainly been guilty of this, is designing products and services for ourselves rather than for the end-users. It’s too easy to get caught in this trap of designing for ourselves when we never leave the comfort of the office and do not understand those who will use the systems we build. To build effective systems, IT folks need to understand their end-users, those who will either benefit from the IT products/services provided or unfortunately, will suffer the daily consequences of having to use systems that are either ineffective or inflict physical/mental pains. If you think I’m being over-dramatic with the last sentence, imagine using a system that requires one to have to repetitively use the mouse to scroll up and down web pages hundreds of times a day. After awhile, you’ll develop carpal tunnel syndrome. Or, what about websites that are not responsive and so the width of the page is wider than the size of the screens the users are using which require them to have to scroll sideways to see the entire page. That could be very frustrating, right? How about web sites that are so heavy with graphics that it takes forever to display (yes, there are still folks around the world who are connected to the internet on slow networks) which leads to frustrations? Developers and designers need to keep end-users in mind when building effective applications that satisfy the needs of the end-users. 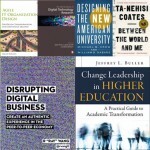 For higher ed IT leaders (or IT leaders in any industry), the burden of responsibility to understand those they serve and their needs are even higher because when at the leadership level, they are essentially dealing not only with technology but business, organizational, and cultural transformations as well. The quality of service and products provided by IT are influenced and driven by their leaders. Consider the following scenario: an IT leader thinks their organization’s role is to “keep the lights on” and so they pursue a strategy where they don’t pursue innovation and attempts to introduce new ideas, which at times could lead to disruptions in services, are punished. Consider another scenario where an IT leader thinks cloud, social media, and mobile computing are all fads and so he/she tell their staff to ignore these fads since they’re wasteful investments anyway. The scenarios I described above are unfortunately not hypothetical. From articles, blogs, etc and from my conversations with other IT leaders, there’s a disconnect between IT and the business units when it comes to understanding what the priorities are and/or how services/products are designed. A big part of this disconnect is the lack of understanding when it comes to what business users want and need. Without understanding the business needs and the end-users, IT will use technology to drive the business needs rather than business needs defining what technologies are to be used. 1) Be part of campus strategic planning processes. When IT leaders gets involved after technology-related decisions have been made, these decisions often have to be re-visited as factors that are only evident to IT folks may not have been considered. IT leaders also need to think like business leaders instead of technologists so they can frame how their organizations can best address business problems and not just use technology for technology’s sake. The efforts of IT organizations must be driven by the missions of their campus and so IT leaders need to understand the missions and priorities of their campus. 2) Understand technology trends. 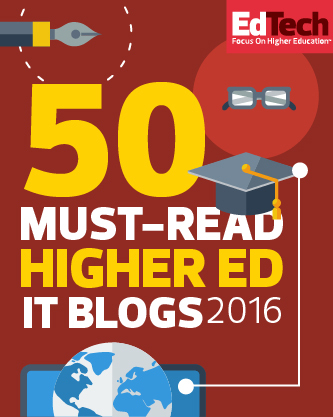 IT leaders are often in no position to be technology experts given their responsibilities as strategists but they should be cognizant of technology trends that impact their campus and higher education in general. 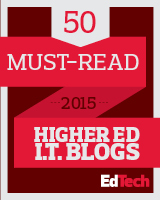 For example publications/orgs such as Pew Research, Educause, Gartner, as well as national higher education organizations from time to time have articles on future technology trends and technology use of different demographics. Attend conferences but not only technology conferences. IT leaders also need to go to conferences attended by the functional business users. For example, student affairs IT should attend conferences held by NASPA and ACPA, the two major student affairs organizations as well as conferences for specific functional units like AACRAO for enrollment management departments. 3) Get out of the office and walk around campus. Observe what devices students are using as they will probably be ahead of IT organizations, especially when it comes to consumer products like social media and mobile computing, and the next wave of computing – internet of things. 4) Get on social media. Some IT folks tell me with pride “I am not on social media because it’s a waste of time!” Frankly, I think that’s a misguided way of thinking. IT folks can learn a lot from the network of other technology and business experts/leaders not only in higher education but other industries as well. Personally, I follow the health care industry because of the similarities between that industry and student affairs, specifically the nature of high tech/high touch service must operate. There are many more ways IT leaders can begin to understand their customers/users and it’s a continuous process. Not only is technology evolving faster than ever but the business challenges/opportunities in higher education driven by the needs of students, economy, and politics are so dynamic and complex that IT leaders cannot afford to be left behind and fail to understand those they serve.